MADISON, Wis., Oct. 4, 2011 (SEND2PRESS NEWSWIRE) — Collegiate Caregivers announced this week the launch of a new home care business that aims to revolutionize the senior care industry through an intelligent and unique use of college students and technology. When it comes to Collegiate Caregivers, service benefits are numerous. Not only do clients receive highly educated, respectable caregivers with a vested interest in their care, they also receive state-of-the-art monitoring through an electronic medical record system. Cost is also beneficial. Collegiate Caregivers provides quality care services at a fraction of the cost when compared to other senior care alternatives. The bottom line is that Collegiate Caregivers can save seniors money. For example, on average, for three hours of one-on-one care, per day, every day, Collegiate Caregivers can save clients approximately 48 percent when compared to assisted living facilities; 75 percent when compared to nursing homes; and 77 percent when compared to memory care units. And quality care at home is something that seniors really prefer. “Having a nursing student as my caregiver brought a professional approach to my needs that I couldn’t obtain anywhere else,” says Steven Kane, a Collegiate Caregiver client. The relationship between students and seniors is really one that is mutually beneficial. For instance, Collegiate Caregivers recently received a call from a woman who had fallen and was about to be released from a rehabilitation center, but needed assistance at home to continue with balance exercises. This client was quickly matched up with a caregiver who is in graduate school studying to be a physical therapist. “Collegiate Caregivers has provided me with a job that I need to help pay for college within the industry that I am studying to work in,” says Andrea O’Leary, physical therapy graduate student. Polzin adds that Collegiate Caregivers ensures that all of its caregivers are appropriately trained prior to entering a client’s home. “This happens through intense online and classroom training taught by a Registered Nurse who also oversees all client care,” explains Polzin. 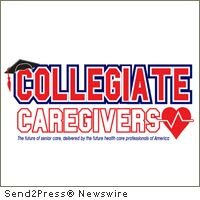 Collegiate Caregivers creates a positive alternative for seniors, college students and the healthcare industry. For more information, visit: www.collegiatecaregivers.com . Curtis J. Polzin, Collegiate Caregivers, 800-897-2290, cpolzin@collegiatecaregivers.com . Original Keywords: Curtis J. Polzin, Collegiate Caregivers, senior care industry, physical therapist, seniors, college students and the healthcare industry, long-term care or senior care services, aging in place, Wisconsin business news Collegiate Caregivers Madison Wisconsin MADISON, Wis.
REFERENCES: Fitness News, Curtis J. Polzin, Collegiate Caregivers, senior care industry, physical therapist, seniors, college students and the healthcare industry, long-term care or senior care services, aging in place, Wisconsin business news Collegiate Caregivers Madison Wisconsin MADISON, Wis.